Superior construction and gorgeous modern style come together and create the Saarinen Tulip Oval Marble Dining Table by Inmod. A reboot of the classic 20th century design by Eero Saarinen, you can choose from popular in-stock combinations or create your own version with a special order option. Either way, you'll be infusing a top of the line, iconic table into your dining space. Arabescato Marble is a sleek and sophisticated natural stone featuring a pale light gray background with accents of darker gray veining and white geometric patches. Italian Carrara Marble features a white & light grey background with soft grey flowing veining. I never get sick of the tulip base, saarinen design is impressive and always looks good in my home, it goes particularly well with my tulip base side chairs! Shopping online with Inmod was so easy, quality of the table was above my expectations. The product and salesperson was exceptional. This marble matches precisely with the marble on my counter tops in my kitchen, I couldn't be happier with my decision! out of this world style ! Oval & marble top with a pedestal base - seriously?!? You can't go wrong with this table - it is the epitome of contemporary chic! SOOO EXCITED! THANK YOU! I ordered the oval table in Arabescato marble with white glossy base which has a darker more prominent veining than the Carrera marble. 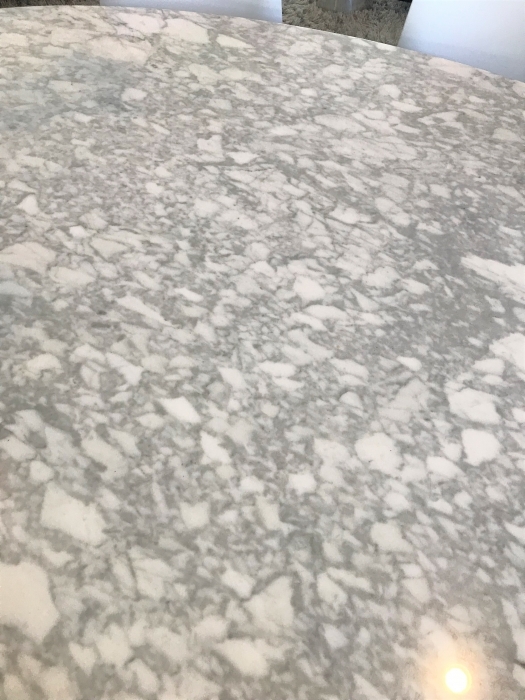 Although the marble pattern veining on my table is more condensed than the sample view on the website, it is still beautiful. Customer service at InMod is top-notch: The table arrived with a chip in the edge and InMod promptly offered a replacement. My next door neighbor has an "original" table with a mat finish that costs 4 times what the InMod version does and I'll bet no one other than me can tell mine is a reproduction. The delivery service was excellent (that table top is HEAVY!). I took a chance on InMod and the quality of the reproduction and I'm glad I did. I won't hesitate to order some new chairs to go with it. The marble top is GORGEOUS! The patterns in the design look amazing and the surface is so easy to keep clean and maintain, i know i'll have this table for a long time - thank you! Love the retro-contemporary look, a perfect match with the saarinen tulip chairs i ordered! Blown away by how perfect this table looks in my dining room! Beautiful, elegant, modern - I absolutely love it! The marble table top in combo with the stem-like base is what sold me on this table! The quality is excellent and its very strong and durable, thank you! I decided to go with a special order white top and white base and it was worth the wait! It arrived around 12 weeks which was ok with me because I fell in love with the table as soon as I saw it. Great price and great service. I was looking for a dining table for a while and couldn't find anything I fell in love with until I came across Inmod. I spoke to a customer service rep and discussed the special order options as I was nervous to purchase it without seeing it. All I can say is they put my mind at ease and the table is everything I hoped it would be. The marble is beautiful and the base is very sturdy. I will most definitely be shopping with Inmod again. Do you ship to Ontario Canada ? We do offer shipping to Canada at an additional cost. You may add your items and quantities to your cart and enter your delivery information during the checkout process, and the shipping and taxes will calculate for you automatically. do you also sell the 96 inch table? Unfortunately we do not offer this item in a 96 inch size. Is the granite top honed or polished? How long is delivery time? The granite top has a glossy finish. The lead time for delivery is about 12 weeks, as since this is a fragile piece, we use a specialized final mile freight carrier, with free inside delivery and assembly (white glove service). Is the marble coated? Is it shines or matte? The marble is coated with a protective finish, but it is not sealed, so we recommend cleaning up any spills promptly. The marble is going to have a slight glossy shine to it. How many people would the large oval table seat? How many chairs do I need for it. The large size can seat up to 8 people comfortably. Hi! What brand is this and what is the difference between yours and Knoll and where did is it made from? 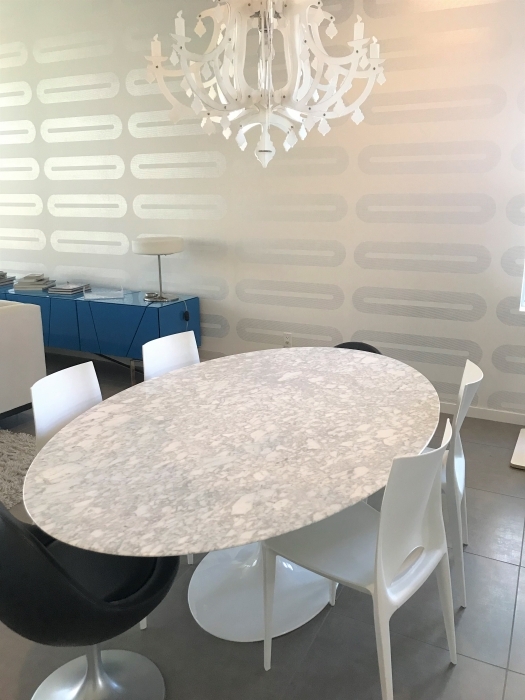 I see that there is Knoll Saarinen selling for higher price and another company that sells Saarinen style for much less just the marble colors look slightly different... Customers gave positive reviews on this which is why i question. Any information would be greatly appreciated, thanks! 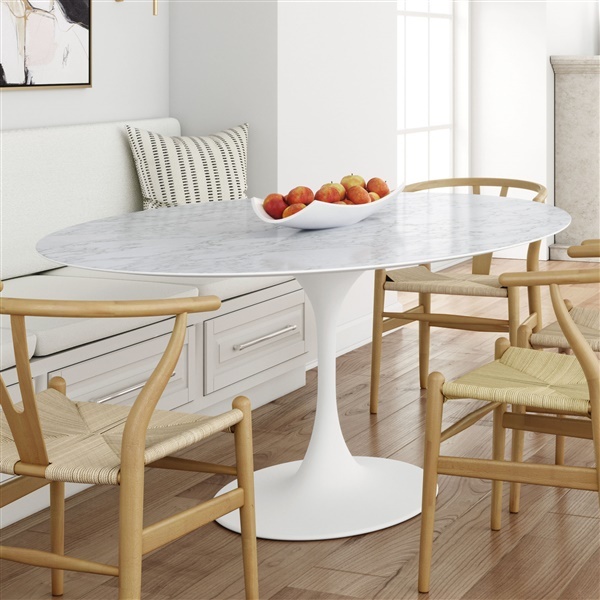 The Saarinen Oval Marble Dining Table is offered from Main Street Modern and is manufactured in an award-winning factory in Asia. It is made using the highest quality materials and goes through a rigorous quality assurance inspection.